Front Row: ? Jort (West Island), Stan Smith, ? ?,Yvon McCutchon, Danny D'All, ??,?? The "Long Wait came to an end for the NDG Maple Leafs last November, on a cold and dreary day at Molson Stadium. After 19 years the Leafs had finally captured their initial Canadian Junior football championship 2-1 from the Edmonton Huskies. The man deemed most responsible for the win was Ian MacDonald, the Leafs' young exuberant and enterprising 25-year old rookie head coach. It was undoubtedly an unforgettable day for Solly Mastro and Glen Brown, the joint founders of the club; for the players, and for Leaf backers like Ray Binmore, Logue McDonald, Richard Ryan, Paul Valois, Ross Heron and others. But the happiest man was the blond 6" 1", 222 pounder Ian MacDonald, the first coach to succeed in bringing the Little Grey Cup to the West End. In 1958, the Leafs dropped the Canadian title to the Saskatoon Hilltops. Between 1962-1964, they frustratingly lost to the Edmonton Huskies guiding his team to victory, MacDonald became the second youngest to coach a Little Grey Cup winner. And with things standing as they are now, it appears he may turn out to be the winningest coach in the history of Junior football in Canada. He inherited the position in 1964 from George Economides, who didn't do badly himself. By the time he retired, because of business pressures, Economides' Leafs had copped several Eastern Canada crowns. But the big one eluded George. When he left, one of three men was a candidate for the vacated job: Ian MacDonald, George Klein, and Gerry Hogan. The latter two opted out because of business commitments, and backfield coach MacDonald became head coach by a strange coincidence. Ian explained it this way: "Gerry Hogan was my boss at Steadfast Rubber, and he assured me I'd be given time off if I took the position." MacDonald is a longtime ardent football fan and player. At West Hill High, he quarterbacked two teams to titles, and, in 1958 was a standout for the Juvenile Ville Emard team. In 1960 he joined the Leafs for two games. Then the professional Montreal Alouettes invited him to their training camp. 'Sam Etcheverry' was still around, so Ian knew his chances of making the AIs was slim. "They gave me a sob story after the exhibition schedule, and asked me to play for the Lakeshore Flyers," recalled lan, a resident of the Northshore, "But then J. I. Albrecht got me a scholarship to a Mississippi school - East Central Junior College. “J. I., he continued, didn't tell me that they (East Central) had already started their practice five week ago. I arrived late, so I went back to Montreal." One year later Ian was granted another scholarship to the state where football is" Queen if not King - Iowa. He enrolled in some academic courses there, but the scholarship did not work out. Pierre Dumont, Jimmy McKean, Don Destonis, Ted Goodwin, and speedy Stan Schreiber. Ian MacDonald has his ideas of how football recruiting should be conducted, and his thinking probably originates from the football mills of the U.S.
"The days are gone when you give up on a prospect after only one try," says MacDonald. "You must persist and you stop only after you see the boy is not interested." MacDonald fondly recalls the Tam Faust 'con job'. It was 1964 and the year before, Faust was on the Quebec Rifle roster. The franchise was moved to Toronto, and Faust settled into his banking job. All too comfortably perhaps. In the ensuing months Faust turned dawn several MacDonald overtures. Finally Faust promised he would come down to one practice. "Well," said MacDonald, "he liked it and he stayed. Tom became one of our better players" In similar fashion, MacDonald has induced players like Pierre St. Amour and Charlie Dunn to play with the Leafs. Another reason for MacDonald's success is because he attends so many coaching clinics, where he has been taught a lot about team organization and practice. In his travels, he has met and talked with Alabama coach Paul 'Bear' Bryant, with Woody Hayes of Ohio State, Frank Broyles of Arkansas and Ara Parseighan of Notre Dame. The NDG Maple Leafs are looking forward to next season. 1965 was the best in their history, as they were undefeated in more than 15 games and won the Canadian championship. Although the team will lose 20 of their players - the nucleus of the squad - MacDonald anticipates a good year in 1966. He characteristically says, "I don't think in terms of losing 20 guys. I like to think that 20 are coming back." Still the NDG organization - considered by the amateur football fraternity to be second to none - have cause to be worried about the upcoming season. A new junior team is in the process of being organized in Dorval, and there is a distinct possibility that they will demand that NDG break up their club a little so as to allow for an even distribution of talent in the league, which has been dominated by the Westenders since 1962. 'Hap' Holland defends NDG's 'packed' aggregation. "They (Dorval) are trying to weaken the Leafs instead of helping themselves. . . any player eligible who played for us in 1965 will do so again if he desires. . . we would be the soul of co-operation if they invited us to their meetings instead of ripping us up the back." Ian MacDonald is not fretting because he is sure none of his players will leave. His foremost concern at present is whether the Leafs can make it 'two in a row' in the Big One in 1966. Verdun Mustangs might just as well throw away the scouting report. Verdun meets Easton tonight at Verdun, but it won't be the same Charger team that looked so lethargic beating TMR Lions 28-14 last Sunday. It was the opening game of the Metropolitan Junior Football Conference (MJFC) for both teams, and the Chargers only managed seven first downs and none in the second half. "Our offence had operated as a unit for only three practices," said Charger head coach Ike Amromin yesterday. "We should be a lot better tonight providing we get the ball." Since last Sunday, one new face has joined Easton and one regular has left. The new player is right half Butch Peddle, rated an outstanding blocker and a good pass catcher, played under Amromin two years ago before moving to Toronto. Missing for a month is Ted Ponell, sidelined for a month with appendicitis. In the other game tonight, the fledging West Island Royals take on Mount Royal at Trenholme Park, starting at 8:30. West Island, coached by Claude Root, won its opener last Sunday against Ottawa Sooners, 33-1. MJFC action also resumes Sunday when NDG Maple Leafs, with end Tom Faust back, take on Ottawa Sooners at Trenholme Park, starting at 7 o'clock. The Leafs, Canadian junior champions, who won their opener last Sunday against Cornwall 21-0, will field two sets of offensive backfields against Ottawa. Quarterback Jim Webster will start, with backs Don Destonis and John Parker. Quarterback Richard Ripstein, Dave Nancekivell and Martin Wenger, form the second offensive set. "Ripstein will probably open the second quarter," said Chiarella. It all depends on how Webster does." Wenger was NDG's top ground gainer against Cornwall with 61 yards on five carries. Webster had 30 yards on four carries. The NDG Maple Leaf scouting report on Brantford football Bisons is short and sweet. NDG meets Brantford in the Eastern junior final at one o'clock Saturday afternoon in Jarry Park and no one in the NDG organization is predicting an easy time of it for the defending National junior champions. "Everybody around here thinks we have an almost automatic trip for the Little Grey Cup in Saskatoon," explains NDG head coach Phil Chiarella, "I wish that were the case. We're expecting a hard game." "They have a good ground game," reported NDG assistant Bruce Barnes who watched Brantford win the Ontario junior title last Saturday with a 26-8 score over Weston Invictus. "More importantly," Barnes points out, "those kids are sky high. They'll be coming down here with one idea - to beat us. They're a serious group." The Leafs will be working every night this week in preparation for the game. Chiarella's biggest worry is shifting his offence to compensate for costly injuries to ends Bob Matthews and Tom Faust. "If they don't come back," Chiarella said, "we'll have to shift Harvey Biggs and John Brown to offence. With Marty Wenger out at corner, we could be hurting." Chiarella found an able replacement for Wenger in Colin Kane and the scrappy former McGill star will sit out the Brantford game and rest for the Little Grey Cup if NDG wins this weekend. "There's a possibility that we won't win," says Chiarella with a worried frown. "Of course we do have a good defense against a running game and that could help us." Of course, when put right on the spot, Chiarella admitted, "I think we're going to win. It'll be tough, but well win." Tickets for the last junior game of the year are currently on sale at McNiece's Sporting Goods, Lord's, Bob Lunny's, Solly Mastro's Service Station and Belvedere Stationery on Sherbrooke Street. Saskatoon - Notre Dame de Grace Maple Leafs of the Montreal Metropolitan Junior Football League arrived here Wednesday night with an impressive array of statistics that should make them favourites in the Canadian junior football final here Friday afternoon against the Regina Rams. The Maple Leafs, making their fifth consecutive appearance in the national final for The Leader-Post Trophy, rolled up 66 points in their final two games en route to the eastern junior championship, while their stout defensive squad didn't allow their opponents a single point. Leafs, defending champions (they defeated Edmonton Huskies 2-1 in the 1965 final), blanked Eastview Golden Eagles 15-0 in the semi-finals and then trampled Brantford Bisons, all-Ontario champions, 51-0 last Saturday afternoon to win the crown. 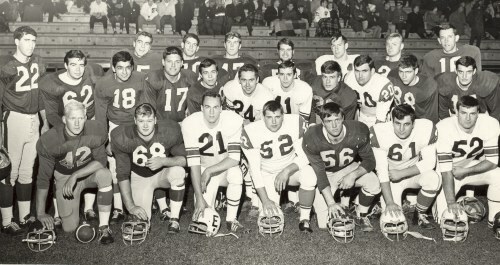 Coach Phil Chiarella's squad had gone 30 games without a loss and on the 1966 season's play they won 14 and tied one. Their defence has given up a begrudging 51 points in 15 games, highly impressive in any league. Asked if he thinks his players might suffer from some kind of letdown after their easy win over the Bisons, Chiarella said, "I think they might if this was an ordinary game, but they know that this is the last game and they'll be up for it." Chiarella said he is reluctant to discuss his defence because the Regina team features two left-handed quarterbacks. "We'll have to make some adjustments to defend against them," he said. "Maybe not right at the start of the game, but we'll have the adjustment ready, just in case." Chiarella said he had scouted the Rams and described them as "a well-balanced, good running club." Chiarella said Rich Ripstein will go all the way at quarterback for his club. "He's smart and a real thinking quarterback," he added. "He's a good passer and we hope to throw a lot providing the weather is good." However the Leaf coach said his club also features a strong running attack and describes Tom Dyce, the Leafs' ace halfback as "the best back in the country out of pro ranks." Marty Wenger, who picked up 141 yards against Brantford while working on offence only, may see some defensive action as a corner linebacker, along with his regular halfback duties. End Tom Faust has been bothered all season by a bad hip, but Chiarella said he returned to form Saturday and should go well against the Rams. (The truth was, Tom had a bad hip pointer which was frozen for the game. He missed two touchdown passes off his finger tips in the end zone, which surely would have been major scores had it not been for the frozen hip) Bob Matthews, also an end, suffered a banged-up knee early in the season and it bothers him from time to time, but he'll start against Regina. The same goes for John Parker, one of the east's top ground-gainers from his half-back spot. Parker was injured in season play, but Chiarella said he'll be fit and well for the westerners. The Montreal coach said that Stan Smith, in his third season at offensive right guard for NDG, is the club's top lineman. He is closely followed by Frank Belvedere and Leo Hoyos at defensive tackle. Meanwhile the Rams, western champions, bussed in from their home base later in the evening. Coach Gordon Currie reported that all hands were in sound physical condition - the healthiest the club has been since it started its drive to the league pennant and championship - and would stage a light workout today. NDG will also hold a light drill. SASKATOON - Regina Rams, in the sixth year of a rebuilding program, battled their way to the pinnacle of success here Friday afternoon when they pounded out an impressive 29-14 victory over defending junior champion Notre Dame de Grace Maple Leafs before 4,500 fans in the Gordie Howe bowl. The victory, the seventh straight for the Rams, gave them possession of the Leader-Post trophy, emblematic of the Canadian junior football championship - it marked the first time the trophy has returned to the province's capital in 28 years, and only the third time that a Regina squad has won the crown. Regina Pats, coached by the late Al Ritchie, brought Regina its first national championship in 1928 when they defeated St. Thomas 9-8, and Regina Dales, coached by Paul Dojack, won the title in 1938 with a 4-3 victory over Montreal Westmounts. Bill McEwan of Ottawa, president of the Canadian Football Union, summed it up as good as anyone when he offered his personal congratulations to the victors in their dressing room moments after they had walked off the gridiron with the title. "I've seen a lot of junior football but I've never seen two better teams play 60 minutes of better football than I did this afternoon and you fellows made sure that everyone in the park knew which was the better team. You are really true champions," said McEwan. It was an electrifying and bruising battle and the Rams were masters in every field. They shook off the effects of a sensational 103-yard touchdown run by halfback Frank Belvedere on the opening kickoff and were ahead 15-7 at the end of the first quarter. They led 21-7 at the half and the third quarter was scoreless. 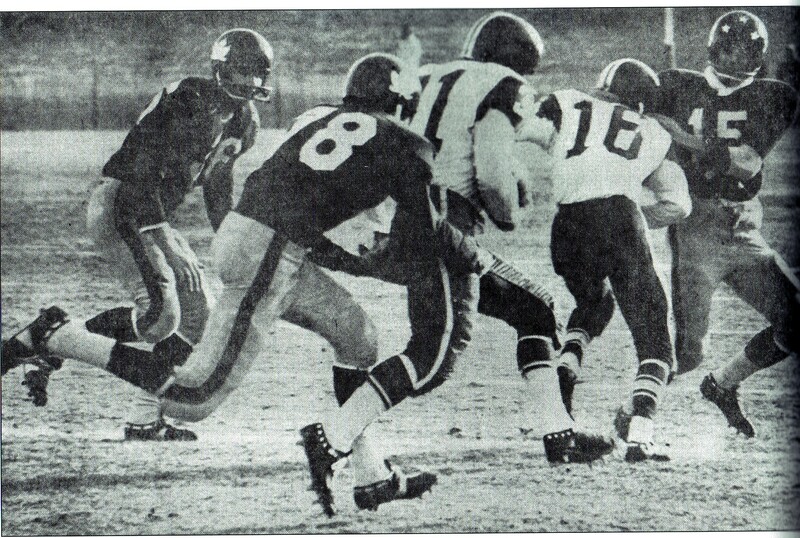 Quarterback Richard Seitz, Mel Flissel, Barry Radcliffe and Ken Newman shared the Rams' touchdowns. Vince Germann booted a 28-yard single and Radcliffe got the other point on a wide field-goal attempt. Defensive halfback Attilio Ciampini scored the other NDG touchdown and Pierre St. Amour kicked two converts. Once again it was the powerful ground attack together with a rock-ribbed defensive effort that paid off for coach Gordon Currie. Grinding out yardage has become a trademark with the Rams, but in this one the defensive unit more than earned their a share of the glory. They were never better. Not only did they make the highly vaunted NDG attack look rather ordinary but actually kept the Eastern champions off the scoreboard as both touchdowns were scored by the Maple Leafs' defensive squad. Statistically Rams had a big edge. They had 18 first downs on 374 yards rushing and 60 yards passing compared to eight first downs for Montreal on 134 yards rushing and minus three yards passing. Newman, who shared fullback chores with Bill Orban, carried 11 times for 106 yards and Orban picked up 99 yards on 15 carries. Flissel got 93 yards on 11 carries and Andrews, used offensively in the late stages, carried six times for 54 yards. Tommy Dyce, the highly-rated NDG fullback, got 84 yards on 12 carries before being injured. An outstanding ball carrier, Dyce was badly shaken up on the final play of the first half when he was hit by Andrews after taking a screen pass from quarterback Rip Ripstein and was used sparingly in the second half. He was finally carried from the field in the third quarter with a shoulder separation. The mark of greatness that has eluded Gord Currie's polished Regina Rams all season was finally recognized Friday afternoon by as tough a set of critics as ever passed judgment - the opposing Montreal Notre Dame de Grace Maple Leafs and a traditionally hostile 4,500 who stomped their approval from icy pews at Gordon Howe Bowl. 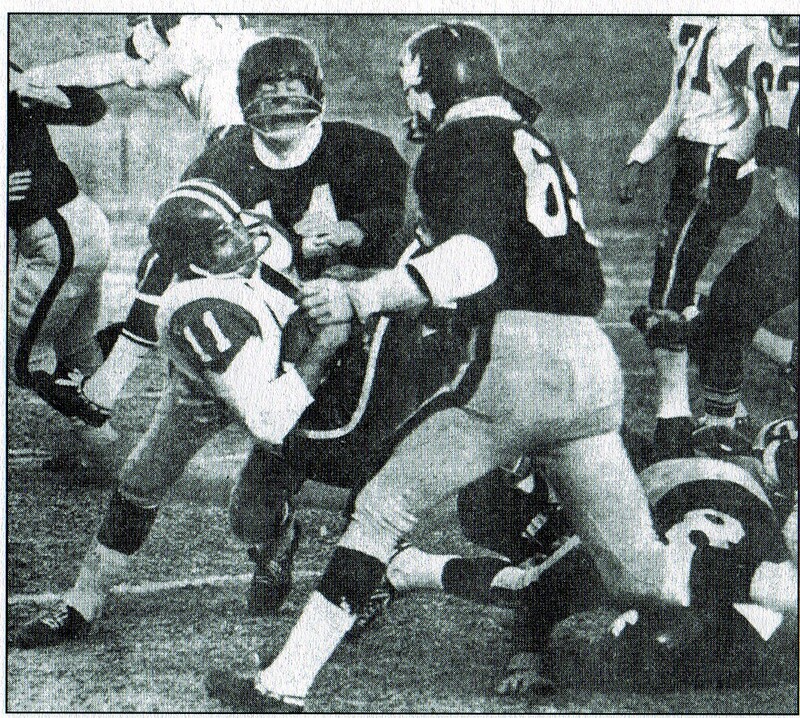 Rams, fundamentally sound most of the time, were punishing masters at every turn in this one and crushed Maple Leafs 29-14 in the Shrine sponsored climax to the Canadian junior football season. For Regina, it ended a 28-year famine. For Montreal, it snapped an unbeaten string that had extended through 29 games. Coach Currie and his Rams, copying from their regular league performance, started slow and brutally battered the opposition into submission as the game progressed. At the end, there was no doubt in anybody's mind as to which team deserved what. NDG, appearing in their straight Canadian final, set the western champions back on their heels by returning the opening kickoff 103 yards for a touchdown. However, the tide soon turned. By quarter time the Reginans and doubled the NDG output and led 21-7 at the half. The third quarter was scoreless before the clubs traded spectacular touchdowns in the final 15 minutes of play. Regina majors were shared by Rich Seitz, Mel Flissel, Barry Radcliffe and Ken Newman. Radcliffe added three converts and a single while Vince Germann also picked up a single. Scoring for Montreal were Frank Belvedere and Attilio Ciampini with runs of 103 and 80 yards, respectively. Pierre St. Amour converted both. Dyce, a brilliant young fullback rated as the "greatest backfielder in NDG's 16-year history", reinjured a shoulder that had separated earlier in the season. St. Amour turned out to be just badly shaken up. Harvey Biggs, a split end, also suffered a shoulder separation in the first quarter and his replacement, Tom Faust, played both ways for much of the game despite aggravation of a hip injury. Several other players were shaken up and missed a few plays. Despite the cold, it was a day for sensational runs and touchdowns. Belvedere set the pattern early by recovering his own fumble at the Montreal seven and racing 103 yards down the sidelines to paydirt. Two key blocks, one little more than a brush, sprang the NDG halfback free at his own 30 and there was no catching him. "The hard field conditions caught our defence on that one,"commented Currie afterwards. "I've seen it happen before where a team rushes downfield only to find the traction prevents turning. They simply rush past the ball carrier." Rams hit back five minutes later with one of their patented overland marches. It started at the Montreal 45 and eight plays later quarterback Seitz faked a handoff, skirted the end for eight yards and dived over the line at the coffin corner. Germann unloaded a short kickoff and Regina defensive halfback Doug Morrice was Johnny-on-the-spot to recover the ball at the Montreal 46. It took only two plays to spring Flissel loose over left tackle and he scampered 42 yards to the end zone. Suddenly, it was Rams' ball game. Rams continued to press and Germann's recovery of his own punt set up the next score late in the second quarter. Kicking high and short against a 15 mph south wind, Germann had the ball bounce directly back into his arms 15 yards downfield and he carried to the NDG 47. The Leafs hadn't really recovered from that setback when, on the next play, Radcliffe picked a Seitz pass off a defenders fingertips and raced over to score. That covered 47 yards. Despite the chilling weather, nobody was leaving the stands as both teams made it a fan's delight in the fourth quarter. Newman, the powerful rookie fullback who was instrumental in Rams march to the Man.-Sask. title, turned a first-and 10 situation into a 38-yard touchdown by crashing over centre, breaking three tackles and dashing into the clear. The score now read 29-7. NDG wasn't to be outdone when it came to the spectacular. Two minutes later Ciampini picked off a Germann pass deep in his own territory and raced it back 80 yards to score. The speedy Montreal backfielder caught he ball at the sidelines and wasn't even bothered in his dash to paydirt. The kickoff was short - purposely - and into the pack. Out of it lumbered Regina defender Rod Smith and he galloped 61 yards down the sidelines to the Montreal three-yard line. On the next play Seitz attempted to pass to Smith, but Ciampini got in the road again with another interception. This time Ciampini took off down the opposite sidelines and he had a good 10-yard lead on the nearest Regina defender. However, the 80 yard dash of a minute earlier had taken its toll and speedy Filssel finally overhauled the tiring Leaf at midfield. NDG went to the air on the next play and Bernie Brandt, a standout defender for Regina, leaped high into the air to pick off the pass and the running started all over again. Fortunately for those weak of heart on both sides, the clock ran out before the pattern could be repeated again. The familiar Regina ground attack, which hammered Saskatoon Hilltops in Ma.-Sask. league playoffs, was again the bread-and-butter play for the new champions . . . Rams completed only two passes but turned 54 ground plays into the customary 374 yards rushing. This compared to 134 yards overland for Montreal. Fullback Newman, who didn't enter the game until midway through the second quarter, crashed for 106 yards on 11 carries. . . . Dave Orban, who started in Newman's spot, went 99 yards on 15 tries while Flissel turned 11 line runs into a 93-yard gain. Gary Andrews put the icing on the cake by picking up 54 yards on six carries, all in the fourth quarter. Dyce, the only Montreal backfielder to really stand out, crashed for 84 yards on 12 attempts before being injured . . . Strong-armed quarterback Rich Ripstein, who also came west with fine credentials, completed only two of 12 pass attempts although on half a dozen occasions his misses were a case of bad receiving. At the end of the game Lieut.-Gov. R.L. Hanbridge of Saskatchewan presented the Leader-Post trophy to Ram captain Larry van Moorleham . . . Jack Rockett of Port Credit, Ont., presented the Jack Bannerman trophy on behalf of the Shriners. NDG Coach Phil Chiarella said, "If we could have played against opposition like this all season we would have won today. Our Metropolitan Conference in Montreal simply has not the same type of teams. For example, in 10 games this year we outscored the opposition 330 to 29." Montreal came west with excellent press clippings on quarterback Rich Ripstein. In most cases the NDG field general lived up to his advanced billing, although his receivers had difficulty hanging on to the ball. NDG quarterback Rich Ripstein got away some good passes, but he also got buried for some substantial losses on more than one occasion by the likes of Gord Ciuca and Cam Clark. "We had a better team this year than in 1965," observed Ian MacDonald, backfield coach who called the shots for NDG last year. Chiarella felt the Rams had a few breaks but offered no excuses for the loss. "They were the best team we've met this year. They got the breaks sure, but I doubt that with the injuries we had, the club would have beaten them anyway." Montreal lost two players with shoulder separations and several others were playing despite nagging injuries. One of those was Tom Faust, who went both ways after an injury put Harvey Biggs on the sidelines. Last year Faust was named the most valuable player in the little Grey Cup game.